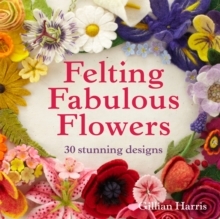 What better way to celebrate and appreciate the natural beauty of flowers than to recreate it into glorious felt that can be adorned, worn or used as decorative embellishments? 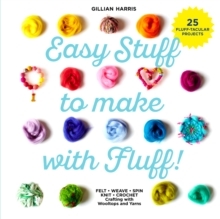 Gillian Harris, bestselling author of Complete Feltmaking and Carnival of Felting, invites you to learn the fundamentals of felting while making bright and colourful blooms. Flowers in an array of colours from near and far are included, from simple white daisies and lilies, cheery yellow daffodils, sunflowers and primroses, to striking red roses, tulips and poppies. If you prefer something more dramatic, there are vibrant pink cherry blossoms, fuchsia, carnations, rich purple irises, pansies and passionflowers. With little more than a selection of wholesome Merino wooltops, you'll soon become adept at fashioning realistic looking petals resplendent with delicate details, as well as crafting stems, seedpods and leaves to give your felt flowers a fantastic finishing touch.